What a beautiful evening! A cool autumn breeze rustled the leaves of the apple tree above me as I turned on my Heathkit HW-8, kindly set up on the picnic table by my son Antonio. The temporary 20m dipole we have strung up right now is only a few feet above the ground (the center-point is right on the picnic table!) so I didn’t really expect much success. And 20 meters was dying — after hearing some greyline propagation from Chile at sunset, I was hard-pressed to hear much of anything. Pretty soon it was obvious that the stations I could hear couldn’t hear me! Oh well, that’s what happens sometimes when you’re QRP. As my odds of making a contact seemed to be plummeting along with the temperature, I decided to call it a night. But then I heard K6LEN come blasting in on 14.050, calling CQ. I replied, and he came right back! The QSB was a little troublesome at first, but he was a solid 599 and he gave me a 569. I think we were both a bit surprised when we found out that we were both running QRP! Len was running 5 watts with his Elecraft K1 in Los Angeles, and I was running maybe 2 watts with my HW-8 1,422 miles away. He congratulated me on having an HW-8 (heartwarming, I admit — I built it when I was 14 years old, and I’ve been fond of it these past thirty years), but I should have been the one congratulating him for having such a fine antenna. His 3 element SteppIR, up 55 feet, really did a great job tonight. Pretty soon I was shivering a bit from the cold, and my CW began to suffer. I apologized for messing up a couple times on my straight key, and Len told me to get inside before I froze to death. As we signed off, Len gave me my first 72. 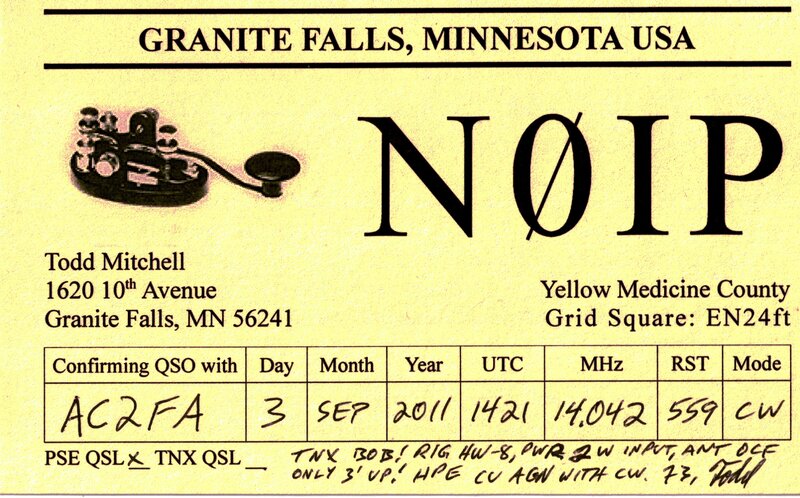 That’s new since my early days on QRP — 73 is the standard way of bidding farewell. 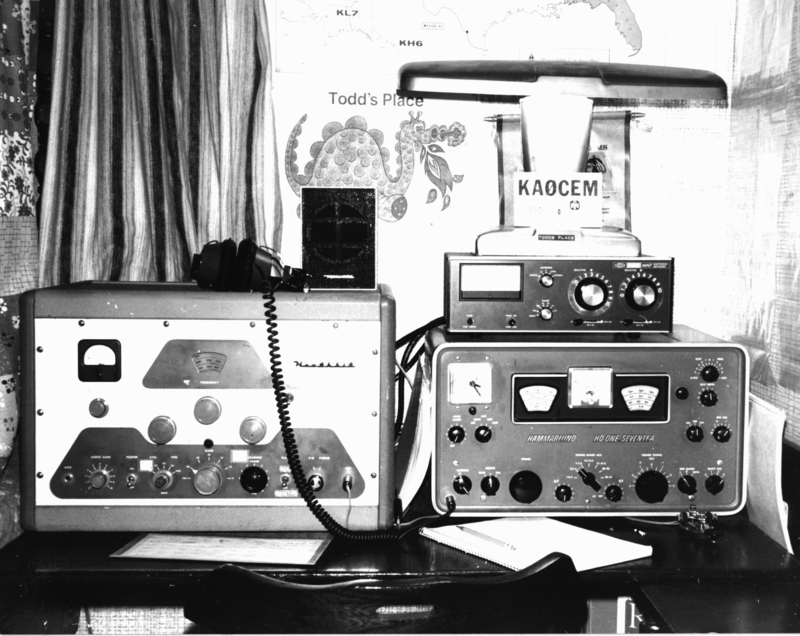 It means, “Best regards!” But instead at least some QRP operators today send 72 when they meet each other on the air, in happy recognition that they’re running less power than everybody else (Get it? 72 is less than 73.). 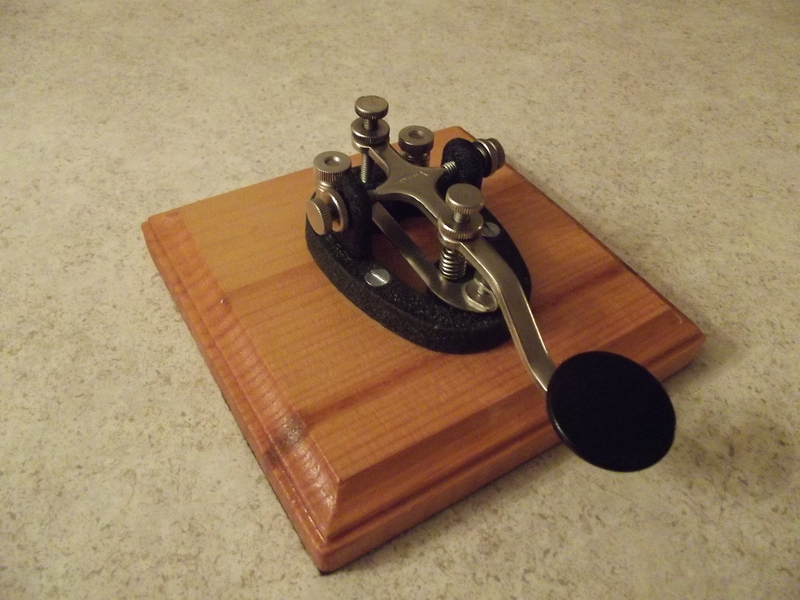 Up until now, I’d only read about this new token of camaraderie among the fraternity of QRP operators. I think I like it! After I packed up and brought my little rig inside, I went back out and picked some of the last okra by moonlight (okay, I used a flashlight too, but the moonlight was pretty). The growing season is winding down; pretty soon the leaves will begin to fall. Maybe next time I work Len, they’ll be crunching beneath my feet! 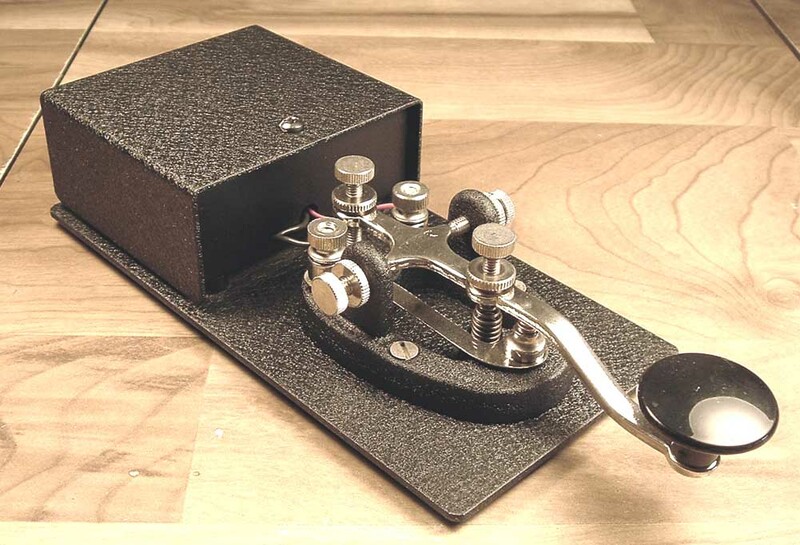 My friend is getting back into ham radio for the first time since he was a boy, and one of the first things he wants is a straight key. I’ve steered him toward the Nye Viking Speed-X key. You can spend lots of money on keys nowadays, and I admit that some of them are mighty pretty. But the eham reviews of the Speed-X key suggest that looks aren’t everything. Unless you’re willing to spend a fortune for a luxury-model, I say put your money on the Speed-X. It’s worth every penny. I found this inexpensive piece of wood at Michael’s (an arts and crafts store). It was unfinished with the edges already routed as shown. When you find your own piece of wood like this, figure out where you want to mount your key. I used nuts and bolts to mount my key, but wood screws probably would have been better (by the time you’re done with this project, you’ll have a hard time getting to any nuts on the underside because they will be covered with felt). If you do decide to use nuts and bolts, drill holes for the bolts now so that you know where those holes are in the next step. Flip the piece of wood upside down and go to work hollowing out as much of it as you can, starting about a half inch in from each edge. I can’t remember if I used a chisel, a Dremel tool, or both, but either would work. Just be careful not to hollow out so much that you punch through to the other side! Leave enough wood in the spots where you’re going to bolt or screw down your key so that you have a good strong mount when you’re done. Once you hollow out the underside of your piece of wood, take a hot glue gun and glue in as much lead shot as you can stuff in there. This is what makes the base nice and heavy so that your key doesn’t jump around while you’re pounding out CW. 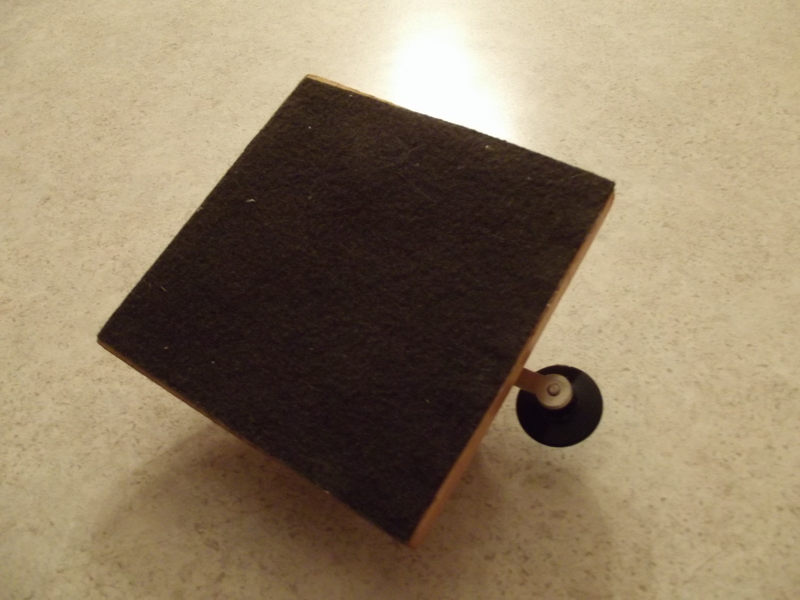 Give the block of wood a quick sanding, stain it with your favorite stain, varnish it, and mount your key! If you are using nuts and bolts, I recommend using a bit of Locktite to keep them from coming loose. If you build one of these yourself, let me know! I’d love to hear from you. 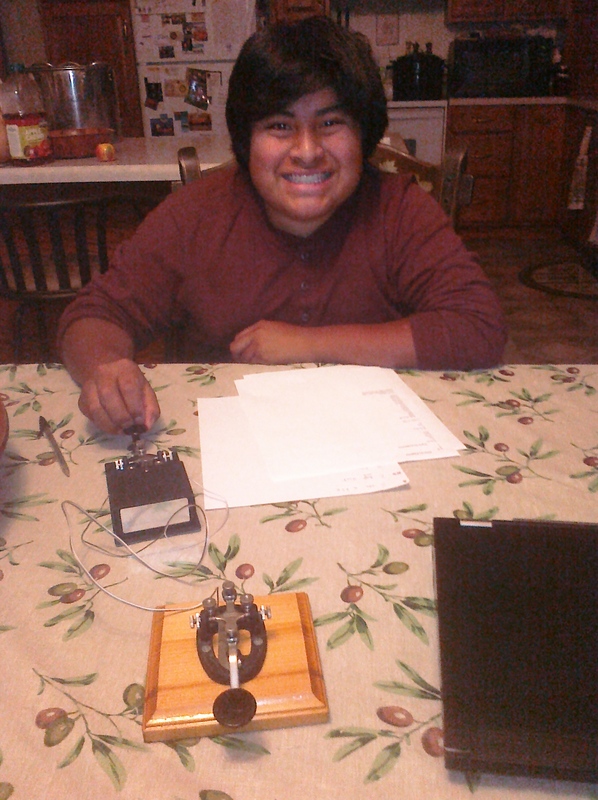 For five months now my friend Keith (ACØVW) and I have been planning to get together and build Ham-Can kits together. Finally the day arrived when we could fit it in! Last Thursday Keith made the 2 1/2 hour drive from the Twin Cities to my house in Granite Falls for a kit-building session. The first thing we did was to inventory the parts in each of our kits. All were present and accounted for except one — a 1000 pF capacitor was missing from Keith’s kit. So naturally I picked up the phone and called Radio Shack in Montevideo, MN. Where else are you going to find a part like this at a moment’s notice out in the sticks? What I didn’t know when I called was that the store had already been closed for a half hour! But still the owner answered the phone, and without saying anything about being closed he went to see if he had the capacitor we needed. When he came back he said that he couldn’t find one, but that it was a bit hard for him to search all of his stock because he had to use a flashlight — that’s when he explained that the store was closed. After thanking him for going to the trouble I started lamenting our state, explaining how my friend had driven all the way out here only to find that he didn’t have all of his parts. We met this gentleman and his charming wife at Subway, where he gave us the capacitor we needed along with a handful of others just for fun. All of this added up to way more than mere marketing. This was heart-warming small-town kindness, and yes, it did instantly make me a loyal customer. Of course Keith and I insisted on purchasing their dinner. They showed us what had brought them our way. In the back of their pickup-truck was an antique mill they had just purchased. They were planning on grinding up a whole bunch of wheat that they had at home so they could make their own bread with flour they’d ground themselves. I gave them my card and told them to call me when they had a loaf of that bread, and we’d have them over for supper. Whatever you think of Radio Shack, it’s still the only game in town for most of us when we need electronic components at a moment’s notice. Maybe we should think twice before going to Wal-Mart or ordering stuff online that we could otherwise get at the local Radio Shack. It may cost a few dollars more, but it might be worth it. If we don’t support our local Radio Shack, it may not be around for long (see here). I for one am sure glad this Radio Shack is still around, and that the owner is such a fine fellow. I’d like to keep him in business so that the next time I come up short when building something, he’s still there to sell it to me.